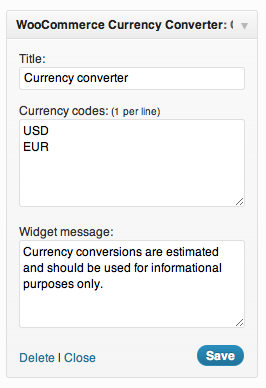 We appreciate your feedback about your support experience with WooCommerce, developers of Currency Converter Widget. This helps us maintain high standards on the WooMarketplace, and helps WooCommerce improve. The widget makes full use of money.js and the Open Source Exchange Rates API, allowing it to dynamically grab the latest exchange rates, and substitute displayed prices in real time. 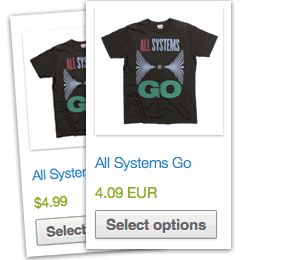 All prices formatted by WooCommerce are updated, even totals. Checkout is still done using your store’s base currency, but the converted price is also stored for your reference. Magic! As an added bonus, when users check out, the converted total is also stored so you know what price they saw. 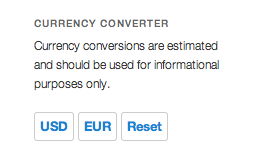 Currency conversions are estimated and should be used for informational purposes only. Checkout/purchases still use the store’s currency. If you’re looking for an extension that allows customers to purchase in the currency of their choice, we recommend WooCommerce Multi-Currency.